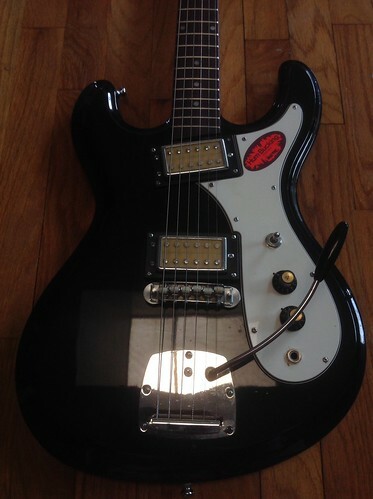 I have wanted a Phase III for awhile because I like Univox's plastic covered humbuckers. 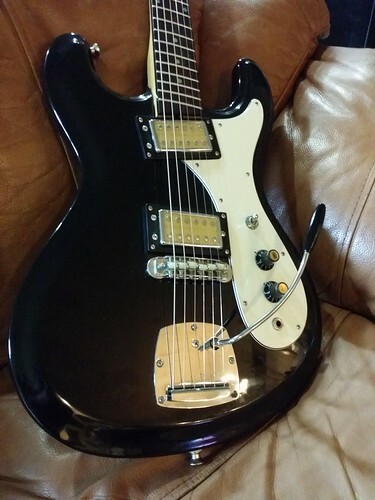 I have a Univox Gimmie with them and they sound awesome. 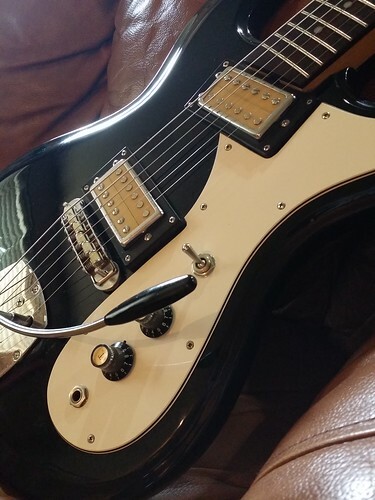 What has kept me from getting one has been that they are almost always sunburst or they have neck pocket cracks and stuff that turn me off. I found this one and picked it up. 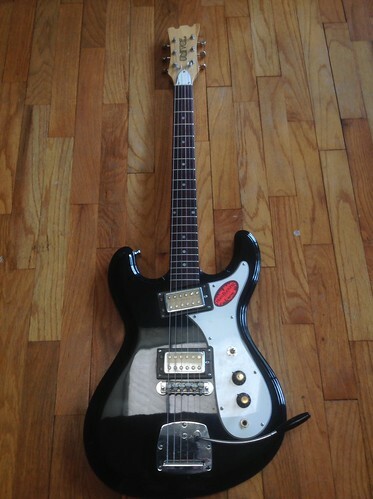 It even has the tremolo bar! It is super clean. 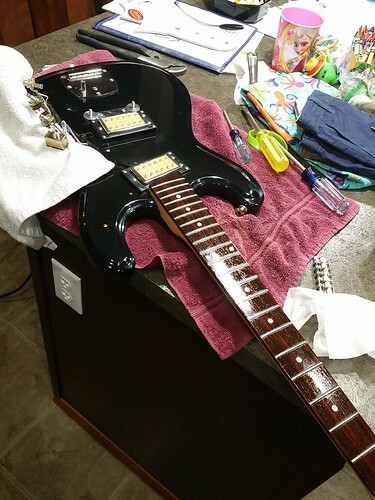 Only non-stock parts are the tuners. They should be a nice upgrade and I am super glad it doesn't show any holes and such. 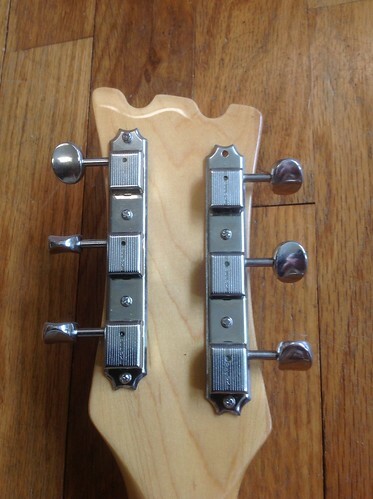 The missing screw is because the fourth hole from the stock ones didn't line up with that hole.... so I have to decide to just leave it with three screws on that side or drill the headstock to add that fourth screw. It is totally stable with the three screws I am sure. It is more of a visual thing to have a missing screw. Here are pics! 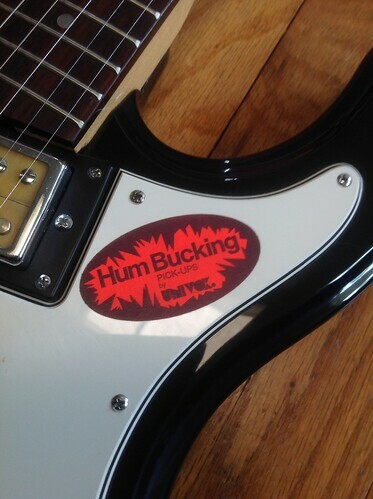 Can you believe the pickup sticker is still on the pickguard?? 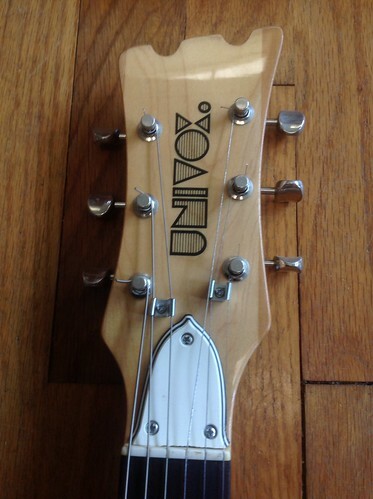 I thought maybe since Univox is back doing the Univibe that they also released accurate reissues of their guitars, that is how clean the guitar looks. Wow that is clean! Has it even been played? Not sure. 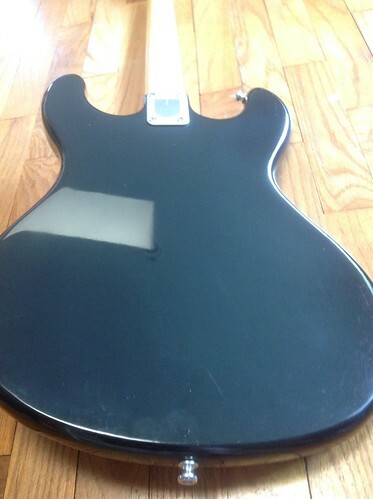 A music shop was selling it. I imagine it has. I will be able to tell more when it arrives. That sticker design could go on a t-shirt. Came in today! It is great! Sounds excellent. 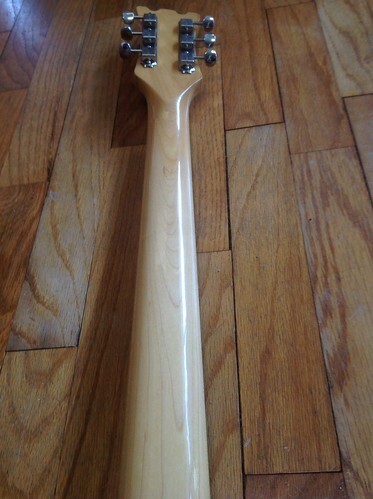 The neck is thin and wide which I like a ton. Low action. 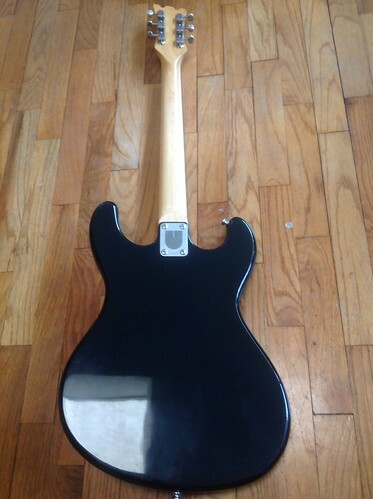 No complaints other then it does have those little finish cracks where the neck attaches, but I haven't really found any of these online without them and they are hard to notice on this one. Not sure what to do with the sticker. I am guessing there is a light spot under the sticker and I don't want to wreck the sticker. Oh I discovered something really interesting. The ghost notes this tremolo plays are the same tones as the beginning to "You Know You're Right." 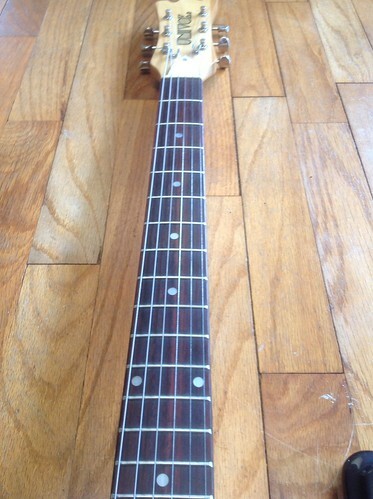 I had tried it with Mustang, Jaguar, and Jazzmaster tremolos and the sounds were similar, but the notes were different. This thing has them dead on. It sounds pretty much spot on for Bleach running through my Randall Commander 210. To drill or not to drill...... I really like the updated tuners. Plastic end ones alway make me nervous when I turn them because I worry they will snap in half. I had one person say I should take these off and put on stock ones... but I actually like the look of these. Only thing I don't like is that missing screw. I could easily drill a hole and put that last screw in to make me happier visually, but then there would be a hole there that isn't normally. 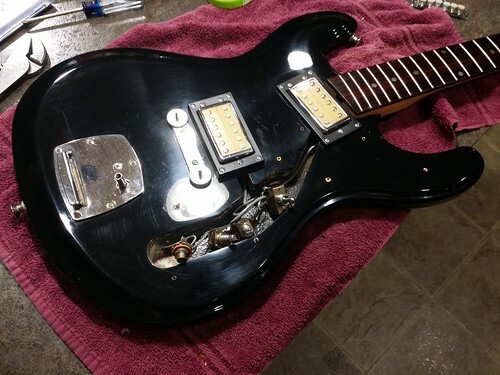 If I ever did want to put old tuners on it (not sure why I would), I feel like the stock would cover up the hole anyways looking at pictures. Thought I would get more opinions. 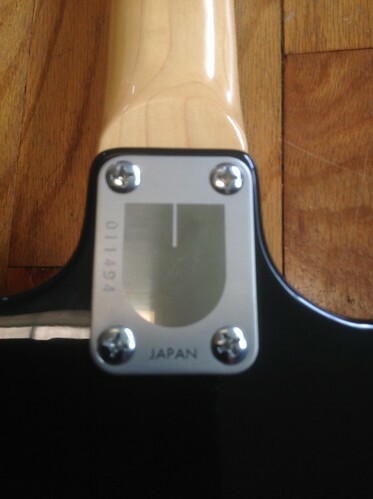 To me, these newer tuners are an upgrade because they are sealed and have metal knobs. Leave it the way it is, especially if it's better for playing. I wouldn't even bother drilling the hole unless it effects playability. 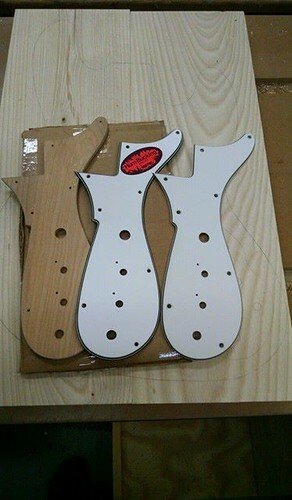 Going to have a copy made of the pickguard so I can save the stock one and avoid messing up the sticker. Never seen one with the sticker still on and I don't want to mess it up. 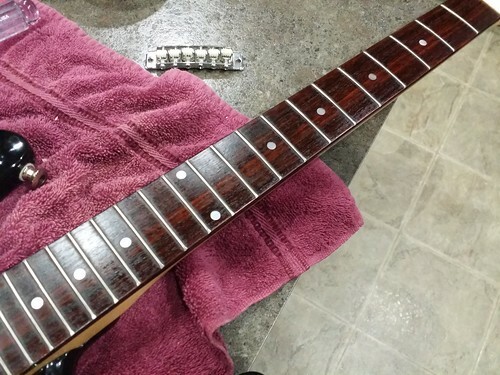 Cleaned the fretboard while I was at it and got rid of the old dirty strings it came with. Also wiped it down to clean it. The toggle was kind of scratchy so I figured I might as well Deoxit the controls while the guard is off. Seems to have cleaned up the noise. 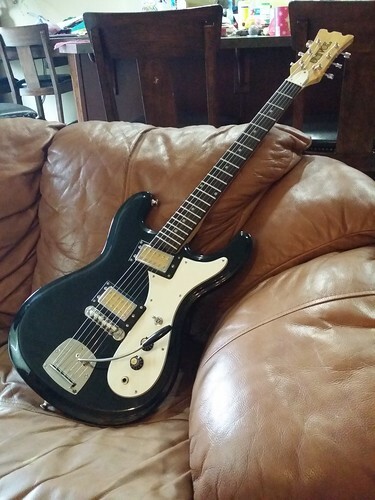 Love this guitar so much. For fans of Teh Kurdtz, the shop this came from is in Aberdeen Washington. I was more excited that it shipped out of Elma Washington's shipping center. Elma is a little town close to the house I was in as a baby. (In Montesano Washington.) Calling this one Elma as a result. Parchment guard is made. Pretty close. Not 100%, but about as close as I could get I think. New guard came in and is installed!